People have started buying things from their phones, albeit cautiously. Let’s not forget that even e-commerce still only represents around a fifth of UK retail. But with 25% of UK customers now having made at least one purchase via mobile and UK web traffic from mobiles growing eight times faster than fixed-line, it’s likely this Christmas could be a bumper one for anyone who gets mobile commerce right. Despite the size of this opportunity, most UK retailers are woefully under-equipped to deal with mobile. The explanations may be true – “we’ve only just re-launched our website” or “but we’ve got an app….”, but your customers don’t care what the excuse is. If they can’t get what they want done quickly and easily on mobile, they’ll simply go elsewhere. Look at Ebay and Amazon: they don’t appear to be complaining about the lack of conversion they get on mobile. When it comes to adoption, the web will always win over proprietary technologies. Now Windows Phone is back in the game, expect to see customers get more comfortable using web apps via their phone’s browser, rather than trawling around their app store. Facebook have started designing for mobile-web first, fixed-web second and native apps last. It’ll save you money if you follow suit and virtually all the functions of a phone (including camera and GPS) can be accessed via a website now and don’t require a ‘native’ app. Responsive design is a function of the latest version of HTML – the language of the web. It allows a site to be rendered individually for each visitor in respect of his or her particular device requirements. There are now so many device variants that offering a choice between your full-size site and a reduced, linear version is no longer sufficient. Rather than designing fixed layouts, responsive design means you can build your information architecture around a hierarchy of goals and actions and the site will configure its layout in the optimum way for each device it’s viewed on. Nothing screams poor usability louder than having to type card details into a phone, and if your customer gets diverted to “verified by Visa” then good luck! Finding alternative ways that customers can pay on mobile will make it easier for them to buy, meaning they’ll spend more. Of the various mobile payment options on the market, few actually seem to solve a problem, but take a look at Pay with Paddle, Droplet (vested interest declared) or even building your own e-wallet like Starbucks. What are your customers trying to do? What do you want them to do? Are they likely to be trying to do different things on mobile compared to when they’re fixed browsing? The fewer the steps a customer has to take to make a purchase, the higher your conversion rate will be, so think about how you could help your customers get to the checkout in fewer taps. What is your customer being expected to tap? Are the buttons large and clear enough for mobile resolution? Is the navigation easy to use on mobile? Are key actions positioned within reach of the users’ thumb – the most likely digit especially if they’re using the phone one-handed? Could you use haptics (auditory or sensory feedback) to help guide your customer along their journey? What about if they make a mistake – is it easy for them to correct? Too many retailers have long forms to fill in that are hard for customers to complete on mobile. What is the essential information you need in order to fulfil a sale and do you need to capture it all upfront? Try taking fields out of any forms you require filling in and see what the impact is on sales. The web means you can take guess work out of design. Many of the suggestions above are generic enough to be relevant in all cases, but nothing speaks the truth like your own customer data. Click (or tap) stream feedback tools can aggregate data about the journeys customers are taking and where they’re getting stuck. For web, make sure you segment your analytics data so you can study things like user journeys, conversion and sales attribution separately for mobile. What can you learn about your customers based on when they use different devices? Remember mobile is a technology choice that reflects the user’s context and environment, not a channel. Could you offer something on mobile that is a value-added functionality to complement the real-world retail experience? What about something that uses the device to do something genuinely useful – like ‘click and collect’, an exclusive loyalty proposition or options to customise what they’re buying. The web has moved on but we’re still treating customers as if they were ordering from a mail-order catalogue. Could you use the fact your customers are contactable and trackable on mobile to deliver their goods to where they are (like Shutl does), not wherever the courier collection depot is? 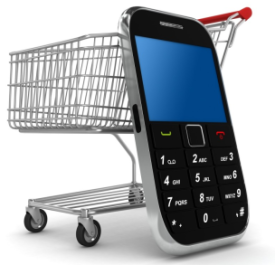 Mobile commerce is at an early stage still. If you’re not careful, claims like “customers convert more poorly on mobile” will be self-fulfilling, as they’ll become excuses for not thinking properly about mobile optimisation. These may seem like big or expensive moves. But the sooner you get on with it and start serving up an experience on mobile that fits your customers’ expectations of your brand, the sooner you’ll stop losing customers on mobile. Steffan Aquarone is a leading online marketing expert and technology entrepreneur. He is a regular trainer and speaker with Emarketeers as well as co-founder of mobile payment solution, Droplet.